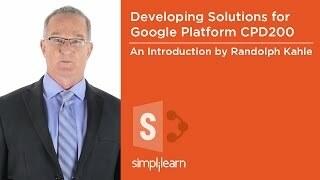 These Developing Solutions for Google Cloud Platform (CPD200) course will introduce you to solution and application development for the popular Google Cloud Platform. Through instructor-led online classrooms, demonstrations and hands-on labs, you’ll learn how to design, structure, configure and test cloud-based applications using Google App Engine, Google Cloud Datastore and Google Cloud Endpoints. This course is an essential requirement for experienced application developers who need to understand how to migrate applications to the cloud and create native, cloud-based applications for the Google Cloud Platform. How do you become a certified Google Cloud Platform Qualified Solution Developer (CPD200)? It is amazing how well can the instructor explains all the concepts, liked the structure of the training. We received all the content, and attention was given to all the students.